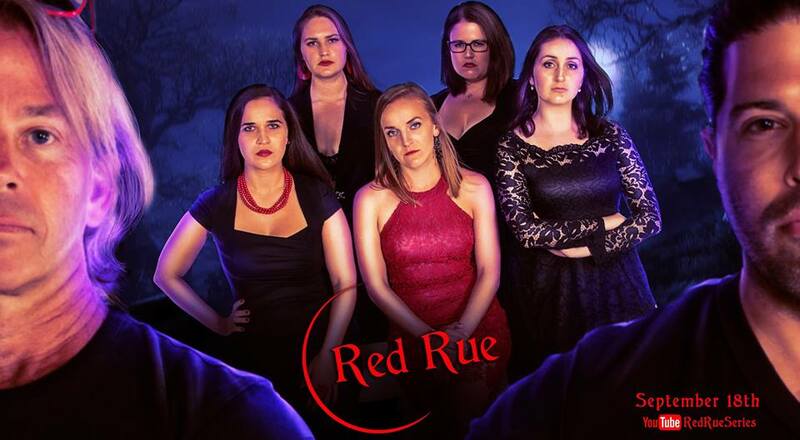 Article first published as TV Review: 'Red Rue' on YouTube on Blogcritics. I recently had the opportunity to review the first half season of Red Rue, a new streaming series from Albertane Elm premiering on YouTube this week. The project is part love story, part trying to prevent the end of the world, with a healthy dose of a mystery that must be solved tossed in. The story begins when Katie (Laura Spires, Hype) moves in with her college roommate, Justine (Cat McAlpine, Holding Patterns). What Justine doesn’t warn about Katie is that the house is haunted by a ghost named Rue (Colleen Dunne, Don’t Fall Asleep), a woman who died of influenza and a broken heart more than a century ago. And, while Rue is definitely a friendly spirit, some evil Hunters are very close to capturing her and opening the gates of Hell. So it’s safe to say hat Katie has a bit more adjustment to make in her new home than most of us after a move. The series hinges strongly on the blossoming relationship between Rue and Katie. Unlike most people, Katie can see Rue right away, and Rue can definitely see Katie, judging by the lingering stares the spirit casts on the mortal. Katie, for her part, yammers away in that familiar style of someone who doesn’t know how to deal with her own budding feelings, especially coming right off a break up, and the chemistry between them is electric. Dunne and Spires convey a lot beyond the dialogue, and it’s hard to take your eyes off of them. Speaking of the dialogue, that’s something Red Rue does very well. While there are some contemporary references that may make it feel dated before long, most of what is said is snappy and authentic. The characters are all very genuine, and they relate to one another well. Rue herself speaks with an older speech pattern, even as her vocabulary matches her present-day friends. This, along with a nice set and production design, really helps the viewer get into the show, all at a higher quality than most web series I’ve seen. There are a lot of unanswered questions when Red Rue begins, and it would be very easy to get bogged down in explaining things, repeating oneself, or convincing each new character why they need to get involved. It’s refreshing that this series doesn’t do that, providing plausible explanation as to why Katie would be on board so quickly, and how translator Stella (Anna Leeper) comes to join the group a few episodes in. Instead, writer / director Michelle Hanson wisely spends her short running time on setting up the mythology and central conflict piece by piece, with clues dropped early on paying off later. Given how things fall into place, I recommend not binge-watching Rue. I did with the episodes I had access to, and it made some of the connections hinted at later feel stronger than they probably will be if you watch it twice weekly upon release. There will be plenty of time to go back later and re-watch parts back-to-back, picking up anything you may have missed. I think it would be more enjoyable not to do so with the first viewing. Making use of its platform, Red Rue is presented with a single camera angle and set, at least from the episodes I’ve seen so far. The explanation is that the bad guys, Hunters Christopher (Stephen Woosley, Dad Bod: By Calvin Klein) and Rob (Andy Woodmansee), are spying on our heroes via their hacked webcam. It does seem odd that the girls don’t take any steps to stop this, especially considering they muse that the Hunters might be doing so early on, so I kind of wish they hadn’t mentioned it at all. But I like the conceit, providing a nice way to do a natural POV format. The cast is terrific all around. Besides those mentioned above, there is also Hardy (Kyle Jepson, Frat House Massacre), Justine’s friend. All the performers, lead and supporting, are acting every second they’re on screen, something lacking in many a show. Some of the subtle reaction moments are absolutely terrific, the actresses always staying in the moment. This is some top-notch work by this roster, and I would gladly watch any of them in other projects in the future. In all, I definitely recommend Red Rue without hesitation. It’s going to appeal to lovers of the supernatural and lovers of love alike, with steady pacing, an engaging story, well-done production, and a great theme song by So Long, Stargazer. This is a fine example of what a web series should be. Red Rue airs new episodes Mondays and Wednesdays at 6 ET beginning this week on YouTube.